When I first saw this book, it wasn't even published yet, and after reading the synopsis, I was really excited to read it. The cover, especially, was what drew me in. It's such a gorgeous cover. I have a thing for apples (don't know why) and the color blue, and this book incorporated both on the cover! Plus, the idea for the book was an extremely interesting concept. I'm not a religious person, but something about creating the perfect person, if you had the choice, was intriguing. Eve in this book was, in all frankness here, playing God. What would she do with this power? Most importantly, what would others do with this power? Sadly, I didn't feel like I connected with Evening. I'm not sure why. There wasn't anything wrong with her, but I just found her to be unremarkable in my mind. Maybe even a little flat, possibly? I wasn't feeling it with her. I also found her to be predictable. She did almost exactly everything I thought she would do. Eve fell into the average heroine category, unfortunately. Solo, the other point of view readers are introduced to, was much more interesting. I'm finding myself, nowadays, enjoying books that have a hero as the main point of view. While Solo isn't my favorite YA guy, he stood out in the book with his personality. He was sarcastic and mysterious, smart and not exactly not the most loyal. Now, he kept me questioning his every move. I had no idea what he was up to--even though parts of the book was in his POV-- and I kind of wish that his mysterious motives could have been prolonged a little longer. Story wise, I wish there was a little more meat to it. While it was entertaining, I felt that some points of the story could have been elaborated more to help build anticipation and more connections between reader and character. Once finished, I was left feeling almost a little indifferent. This book neither made me super happy nor angry with it. It just was. And even Adam, this supposed swoon-worthy character, didn't make me get any butterflies or anything once he glanced the page. I wasn't feeling him. 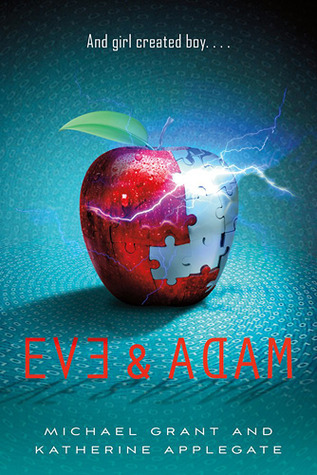 Was I disappointed with the outcome of Eve and Adam? Yes. There was a lot of positive talk for it, but once I finished reading it, my expectations were let down. However, that does not mean that I didn't like this book, because, mind you, I did find this book to be interesting. It was the concept, mostly. A sci-fi where a top-of-the-line medical institution secretly has plans to create a human from scratch, and our main girl, Eve, is the one chosen for the task of creating that person. Fans of cloning, sci-fi--heck--even dystopia might enjoy this book. I definitely agree that there was a lack of emotion for me in this book, just in general. I had issues connecting with Evening as well, and I felt absolutely nothing for Adam, who we were supposed to totally fall for. That never happened for me. However, I did enjoy the concept of this book, and it was great to see the genetic aspect of this book. I've wanted to read this one since hearing about it! But it hasn't gotten the best reviews so I'm not sure if I want to read it. I love the cover too! I think it's so pretty :). Wonderful review Millie! I'll have to decide whether or not to read it. oooh no.. I had such high hopes :( But I trust your opinion! .. I think I want to still give it a try. But I will go in prepared! Thanks for the Honesty!